Now that we’re a week into 2015, I feel a belated urge to offer up a neatly-wrapped version of my 2014 — you know, the kind of bloggish year-in-review that those writers on top of their game presented in the dwindling days of December. If you’re looking for evidence of grand, probing contemplation of the past year and its moments of deep significance, I’m afraid you’ll be disappointed in my quick-and-dirty version of a year-end wrap-up. I have selected one photo from each month of 2014 for a collection of twelve vignettes. These dozen snapshots will not present anything resembling a comprehensive look back, not least because there were a number of months in which lots of things were going on and I [arbitrarily decided that I] may only choose one picture. These pictures aren’t necessarily the most important or best artistically or any other superlative from each month. Still, each jumped out at me for some reason, so we’ll go with that and try to keep the analysis to a minimum. This dusting of snow completely shut down our area for three full days. 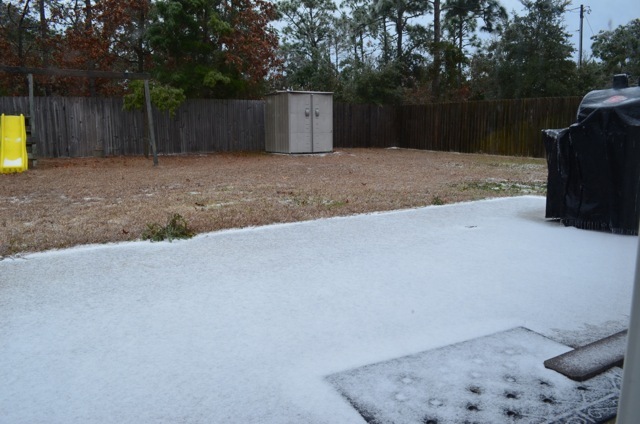 The first month of 2014 brought something rarely seen in the steamy, Southern city of Pensacola, Florida: frozen precipitation. Although we grew up rolling our eyes at the way the DC area flails when it snows, even that looks like steely-eyed competence when compared to the Florida panhandle response. Of course, snow happens so rarely here that one can hardly blame the locality for investing in hurricane prep rather than plows, salt, and gravel. It was fun having my husband home for three unanticipated “snow days” from this single dusting, and we indulged in wax log fires and obsessive jigsaw puzzling. A denizen of the Gulf Breeze Zoo surveys his domain from above. Any semblance of a Floridian winter evaporated quickly, so we were soon enjoying “spring” with outdoor activities and strolls through the Gulf Breeze Zoo. 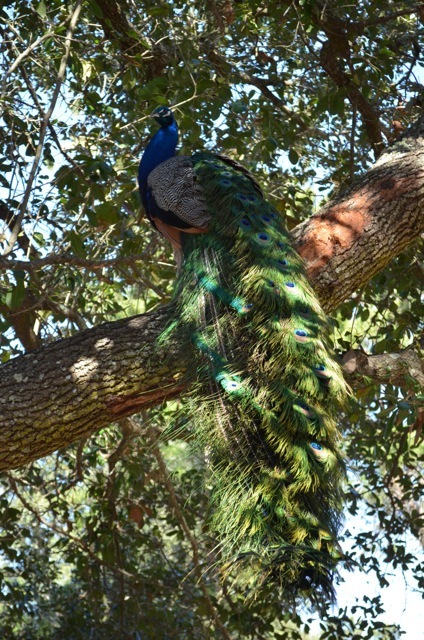 I had no idea that peacocks were even capable of getting up into trees; I’d always thought of them as ground-dwelling birds, akin to fancy chickens. March brought the Jewish month of Adar II, which brings Purim! Purim is one of the most fun, carnivalesque holidays on our calendar, and its celebration involves reading the Book of Esther, dressing in costume, and imbibing spirits. 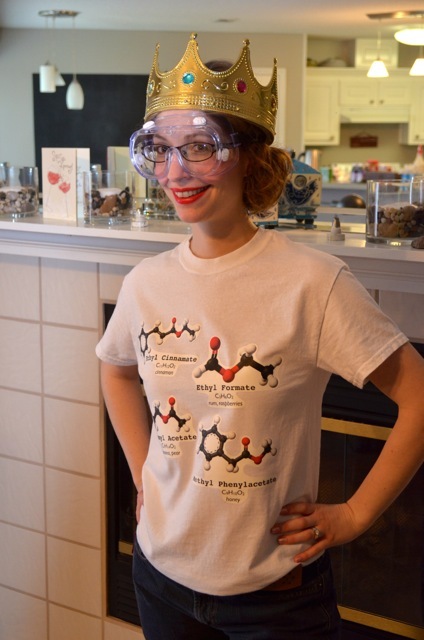 I let my geek flag fly with a punny “Queen Ester” costume: each molecule on my shirt is a different ester, which are often responsible for a particular fragrance. 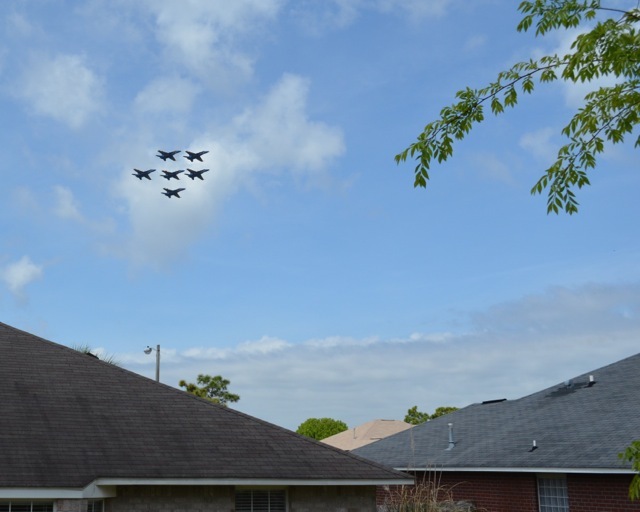 We have an excellent view of the Blue Angels’ twice-a-week practices from our backyard. 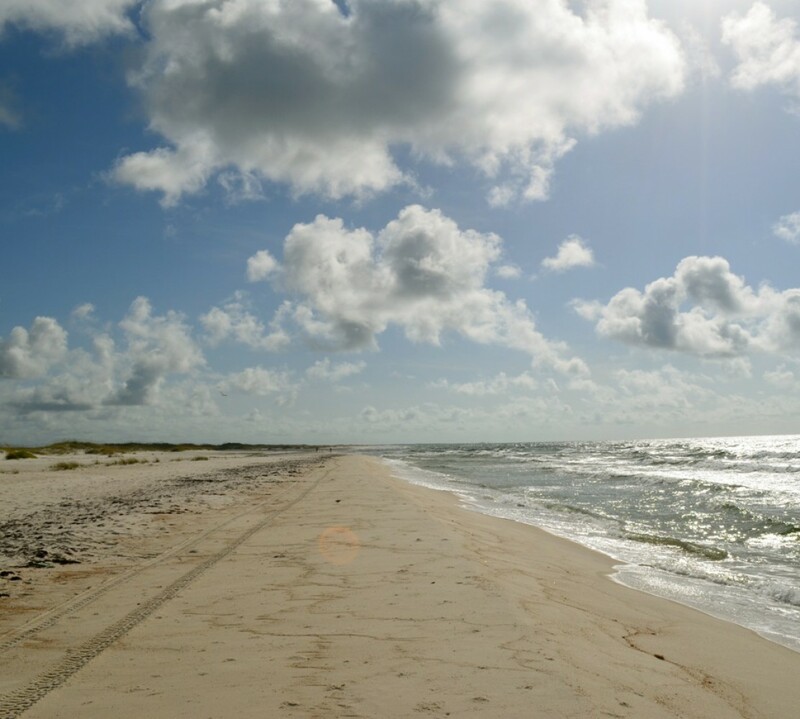 In order to minimize my husband’s commute to the flight line, we chose to live very close to NAS Pensacola. One of the advantages (or disadvantages, depending on how one is disposed toward the “sound of freedom”) is that we essentially get a free air show from the Navy’s flight demonstration squadron twice a week throughout much of year. I like the Blue Angels, despite the fact that working around their practices is a pain for my husband and his fellow instructor pilots on base. It gives me a warm fuzzy that Pensacola natives, by and large, take a great deal of pride in “their Blues” even if they have no official military affiliation. In honor of my husband actually being scheduled to fly today for the first time in millennia*, here is a video of fresh-faced young SNAs flying the aircraft he flew three years ago. Makes the mighty T-34 look pretty cool, huh? Of course, all my flight experience to date is in wee Cessnas, so take the fact that I would jump at the chance for a T-34 ride with a grain of salt.